Luckily, several potential sources of immediate income are available in this situation. If approached carefully and with the aid of competent divorce professionals, you can secure yourself after divorce in ways that you never considered. Passive income is money that you receive on a regular basis from an earlier investment, but are not actively working to obtain.This could include income from rental properties, royalties, captial gains, interest and dividends from financial investments. Negotiate how to split these assets. Many divorcing spouses over 50 carefully negotiate those assets in a divorce which generate passive income so that it can be included as part of a well-balanced portfolio for their post-divorce financial estate. Understanding reliability and history of passive income sources. For example, if you use a rental property as a source of income, you should review how frequently the property is rented and how reliable tenants are in paying rent. Also, with regard to money investment accounts, since markets can often be volatile and unpredictable, it is important to take the time to think about the future potential of this income source, and the attendant risks involved, before you can rely on it as a steady and permanent source of income. It's easy to forget about passive income as a source of liquid assets, yet it can be very valuable when trying to make ends meet after a separation or divorce. Spousal support is a claim filed in court where one spouse asks for temporary financial assistance from the other until the divorce proceedings are finalized (a court-contested divorce can easily take 2-4 years to finalize). Spousal support is often the first step in the transition towards a spouse's future financial independence. A spousal support claim in PA usually takes 2-4 weeks to get a hearing, with the claim being retroactive to the date it was filed. If you mediate your divorce, however, temporary spousal support is usually not necessary and the focus of the discussion is centered more around post-divorce alimony. This is because the mediation process is much faster and avoids court altogether. Alimony is a type of financial support from one former spouse to another. For example, this kind of support may be necessary for a spouse who was financially dependent on their partner over a period of time and may need some support after a marriage to assist them in gaining a footing of financial independence. Different types of alimony serve different purposes, whether more temporary, longer term or even permanent. Three common types of alimony include permanent alimony, reimbursement alimony for a term of years or rehabilitative alimony. Sometimes, instead of having monthly alimony payments apply in their settlement, spouses can negotiate a lump sum cash payment of alimony at the time of the divorce in lieu of monthly alimony payments post-divorce. This lump sum payment transfer, as part of the divorce settlement, has no tax consequences. Many factors determine alimony. When preparing for divorce, it is important to note that no two divorces are alike and alimony eligibility laws vary between states. In PA, for example, there are 17 different factors the courts use to determine alimony; and there is no mandated formula. Typical factors include a spouse's health and age, length of the marriage, earning capacities of the spouses, a spouse’s ability to pay, employability, and children in a household. All of these can determine the amount, duration, and payment of an alimony award. Alimony is taxable. Recipient spouses should also be aware that alimony is taxable to them as ordinary income so some careful tax planning with an accountant needs to be done in conjunction with their financial plan. Remember that alimony payments are either the decision of the court or can be negotiated between you and your spouse through the mediation process for divorce. When you divorce over 50, you may be eligible to withdraw retirement benefits and options at the time of a divorce, based on years of accumulated marital retirement assets during the marriage. 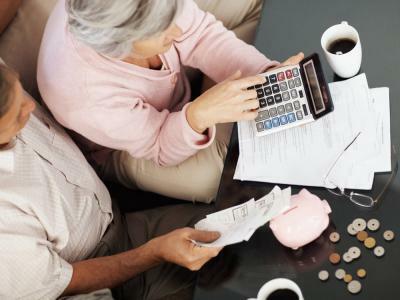 Retirement assets potentially available in a divorce to help you financially secure your future may include: 401(K) accounts, company pensions, 457 plans, deferred compensation plans, thrift savings plans, IRA's and other personal retirement savings during the marriage. Assess your specific situation. With retirement transfers upon a divorce, a spouse must be aware of all the requirements and limitations involved, as well as potential tax and penalty consequences upon these transfers. That's why you'll want to consult a financial professional such as a certified divorce financial analyst to assess your particular situation. 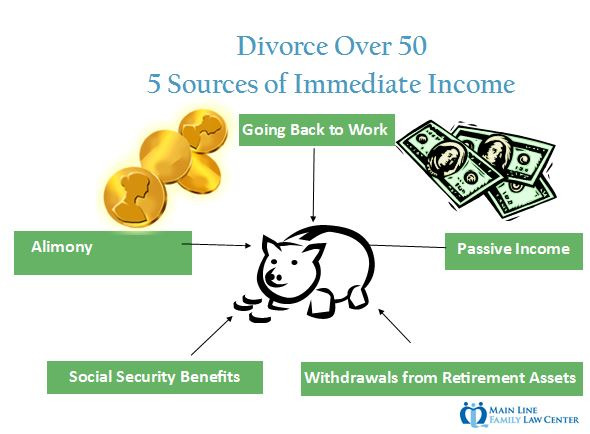 The faster you can settle your divorce, the quicker you will have access to retirement funds. You don't want a divorce to hold up your retirement plans, so consider the more amicable option of divorce mediation to assist you in acheiving a much quicker and less complicated settlement. In mediation, your matter can often be settled in as little as 3-6 months. Retirement assets can help keep you financially secure well into retirement if you invest the assets prudently. What about social security benefits? Reliance on these funds is crucial in a divorce over 50 as you prepare your retirement plan. These may be collected either on yours or your ex-spouse's employment record. Generally, if you were married for at least 10 years at the time of divorce, and are at least 55 years old, you may be eligible to make a claim on your former spouse's social security record. This does not effect the amount of their benefit which they earned. Check with your local social security office to learn more about your eligibility. Part-time work can increase your cash flow situation considerably. Use it to support your daily living expenses like rent, utilities, car payments, etc. Not only that, but the social interaction with coworkers, networking and keeping your skills sharp is crucial for your mental well-being. In addition, if you have been out of work a long time prior to a divorce, a coach or career counselor may be a valuable asset to your divorce team, especially since you might need a confidence boost and guidance in identifying your marketable skills, while brushing up your resume and interviewing chops. Need help pulling out of your financial situation to get a divorce? Main Line Family Law Center today.